If you’re thinking of buying your first furry small pet, the Super Pet My First Home Multi-Floor is the perfect choice. It’s the ultimate starter kit containing everything you need to bring your pet home successfully. Each cage is constructed from chew-proof coated wire with narrow pet-safe .5-inch spacing and stain-resistant plastic parts. You also get a Comfort Shelf, Safety Ramp, and food dish. The deep scatterless base removes easily for quick cleaning. Easy snap-together assembly with no tools required. Measures 12.5 x 24.5 x 14.5 inches, giving your new friend plenty of room to frolic. 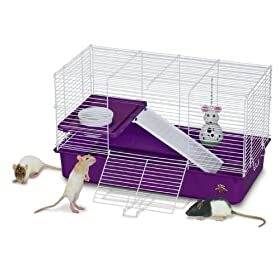 The deluxe my first home for pet rats provides great living space for rowdy pet rats to roam. Comes complete with a comfort shelf, safety ramp, food dish, and fun toy. The deep plastic base prevents bedding from scattering while the white wire top makes for easy viewing and superb ventilation. 1/2-inch spaced wire bars. Click here to Purchase!